After cruising to a victory at the Ed Headrick Hall of Fame Classic last year, Catrina Allen said she was finally starting to feel comfortable on the W.R. Jackson course. 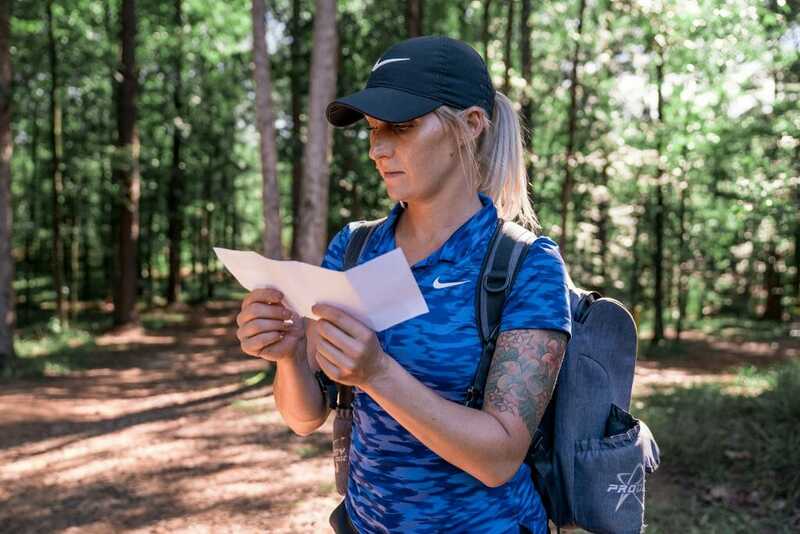 Even with the changes made to the venue, Allen’s clubhouse score showed no sign of slowing down her killer pace at the International Disc Golf Center Friday. Allen was temporarily stalled before her scoring picked up in the afternoon. Through the front nine, she was 4-over par with zero birdies and two-putts on two holes, but still within a handful of strokes of the lead. Once the drives and approaches starting finding the Circle after the turn, the birdies started falling. Allen finished her round with five birdies on the back nine to finish at 1-under par 66, the only player in the division with a score in the red. Allen led the field in fairway hits, Circle 1 in regulation, and Circle 2 in regulation. Two Circle 2 putts for birdie helped build the three stroke lead after one round. The Jackson course doesn’t offer the highest degree of scoring separation and the grouping of women trailing Allen proves it. Paige Pierce is in solo possession of second place at 2-over par 69, and the next four women behind her are tied in third place at 4-over par 71. Pierce’s three birdies on the day were second only to Allen’s five. Two of Pierce’s birdies came from well outside Circle 1, proving that even if you have the distance to reach the long wooded holes in regulation, you’re still not guaranteed a good look at the pin. Elaine King, Sarah Hokom, Jessica Weese, and Lisa Fajkus make up the third place consortium. All were able to limit the mistakes to keep scores as close to par as possible. King was one of five players in the top 10 to not record a birdie. Of the six new holes on the course — holes 3-6, 11, and 16 — only two birdies were recorded out of 126 tries. Allen got the 297-foot par 3 hole 16, and local Haley Childs nabbed the 327-foot par 3 hole 4. Both women placed their drives inside Circle 1. The lead card of Allen, Pierce, King, and Fajkus tees off on W.R. Jackson at 8:50 a.m. local time. Follow along on UDisc Live and watch next-day coverage on the Disc Golf Guy YouTube channel. Comments on "Allen Picks Up Where She Left Off At Hall Of Fame Classic"